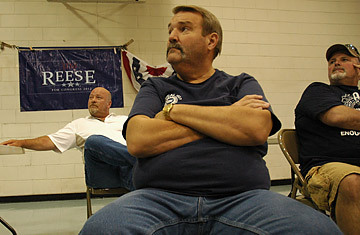 Auto workers listen to local candidates at a union hall in Heath, Ohio, during Joe Klein's annual road trip on Thursday, June 14, 2012. In the early afternoon of June 19, 2012, my third annual road trip collided with Mitt Romney's presidential bus tour in the lovely little town of DeWitt, Mich. I suppose it was inevitable that sooner or later we'd come across a full-fledged stump speech, and there was Romney, in front of Sweetie-licious Bakery Caf, saying, with utterly feigned surprise, "We came here to have some cherry pie and we find all these friends standing here," as if his campaign hadn't spent the last 24 hours blocking off Bridge Street and setting up loudspeakers and security posts. But I quibble: Romney was actually a lot better than when I last saw him during the Republican primaries. He had some new lines, like, Obama "promised hope and change, but now he's hoping to change the subject" from the economy. Occasionally, he even hoisted himself to moments of semi-convincing passion. He said he was going to get the Keystone pipeline built, and here he started to yell, "if I have to build it myself!" The afternoon was notable for another reason. After 19 days on the road, I finally found an unalloyed, enthusiastic Romney supporter. Her name was Penny Ancel. She had worked for Governor George Romney as a paralegal. "He was intense," which was clearly a euphemism, "but there was never any question where he stood." She supports young Romney "because I know the integrity and honesty he was raised with." And she really didn't like Barack Obama. Well, maybe her support was more of a father-to-son bank shot. The polls are close in Ohio and Michigan. Both Romney and Obama have problems in the heartland, but Romney's are more serious. People have mixed feelings about the President. Most are disappointed that he didn't turn out to be Superman, but they credit him for trying hard and for being smart, honest and benign; others have legitimate policy beefs with the Obama Administration, especially environmental and regulatory complaints in the coal country of southeastern Ohio; and then there are some who see him as the devil incarnate. Romney, on the other hand, inspires very little passion one way or the other. Midwestern businessmen tend to trust him for that reason, but most of his other supporters simply see him as the lesser of two evils, at best. "Romney smells like money to me," said Janice Jarvis, an Ohio Republican whose family was in the process of tumbling out of the middle class. I met her as she stocked up at a food pantry in Newcomerstown. Her husband had taken a 60% reduction in salary at General Electric; her son and daughter-in-law had moved back home, jobless (although her son was just starting work on a garbage truck). "But I guess I have to vote for him." Why? I asked. "Because I think Obama is hiding the truth about his past. I think he's a Muslim and he's trying to destroy America. One day the truth will come out."